In an effort to ‘make it right’, NAB has promised to compensate business customers who suffered losses. 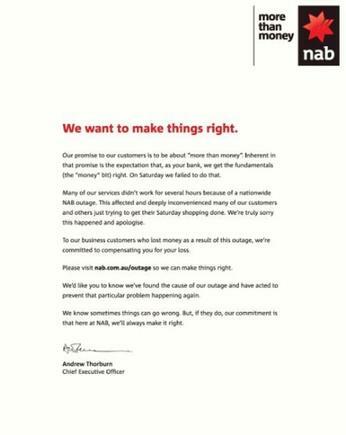 In its printed apology in News Corp newspapers today, NAB CEO, Andrew Thorburn, said sometimes things can go wrong. But, if they do, the commitment is at NAB to always make it right. “Our promise to our customers is to be about more than money," he stated, echoing the bank's brand campaign. "Inherent in that promise is the expectation that, as your bank, we get the fundamentals [the “money” bit] right. On Saturday we failed to do that. “Many of our services didn’t work for several hours because of a nationwide NAB outage. This affected and deeply inconvenienced many of our customers and others just trying to get their Saturday shopping done. 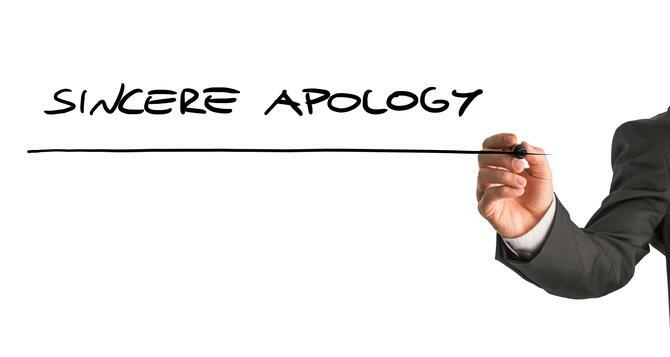 We’re truly sorry this happened and apologise. Commenting on the choice of print advertising, Carat Media CEO, Paul Brooks, said print remains a trusted, authoritative medium with consumers. This is despite the digitisation of media and decline in despite in print readership across mastheads. “There is a degree of finality to it that works well from a trust perspective. Once something’s printed in black and white, there’s no going back on it or changing the narrative, which shows readers – and customers – a willingness to stand by what you’ve said,” Brooks told CMO. Brands will make mistakes, like anyone. It is how they handle those mistakes which can make or break them, Brooks continued. “In situations like this, where trust has been compromised, people are generally looking for three things: Transparency, action, and empathy,” he explained. “Naturally, they want to know what happened, why, and what you plan to do – or ideally are already doing – to rectify the situation. Where brands can often fall down though, is on in the final aspect – empathy. Without acknowledging the impact or ‘cost’ to the customer in a genuine way, you’ve really only gone part of the way. NAB customers have been directed to visit nab.com.au/outage and lodge their complaint.